The Christophe Claret Soprano Tourbillon Minute Repeater features a 4-note minute repeater that strikes Westminster Quarters on cathedral gongs, a 60-second flying tourbillon and Charles X style bridges. The impressive mechanics are on display, from the front or the back, as the dial has been removed. Aesthetically, with the Soprano, Christophe Claret successfully blends traditional haute horology with avant garde design. The Soprano is a testament to Christophe Claret’s manufacture which specializes and has long been an innovator in striking complications, tourbillons and sapphire components. For example, in 1997 Christophe Claret was the first to incorporate sapphire components, which included plates and Charles X style bridges, in a wristwatch movement. The Soprano is presented in a 45mm x 15.32mm red gold anthracite PVD titanium or white gold and anthracite PVD titanium case. 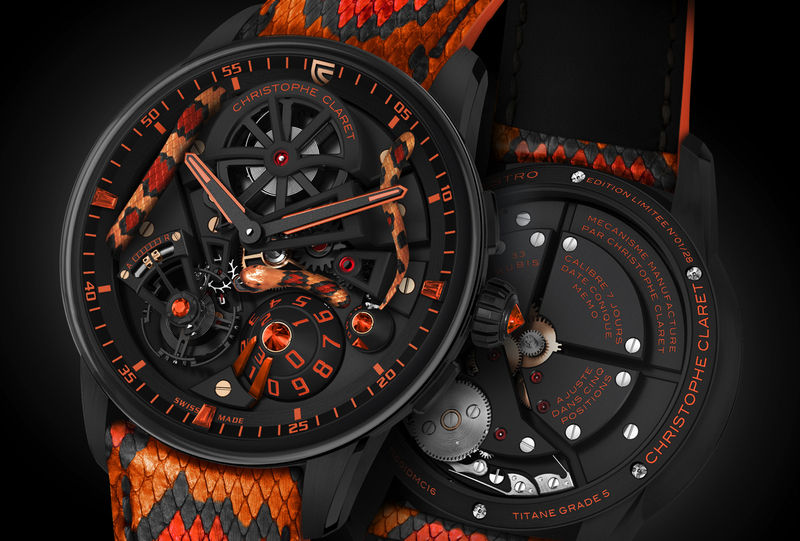 The red gold version features anthracite PVD and black spinal hands; the white gold version features black PVD and ruby or blue spinal hands. Powering the Soprano is in-house mechanical hand-wound caliber TRD98 which has 450 components, 39 jewels, a 72-hour power reserve, balance oscillates at a rate of 21,600 vph (3Hz) and a single mainspring barrel in a transparent sapphire crystal. 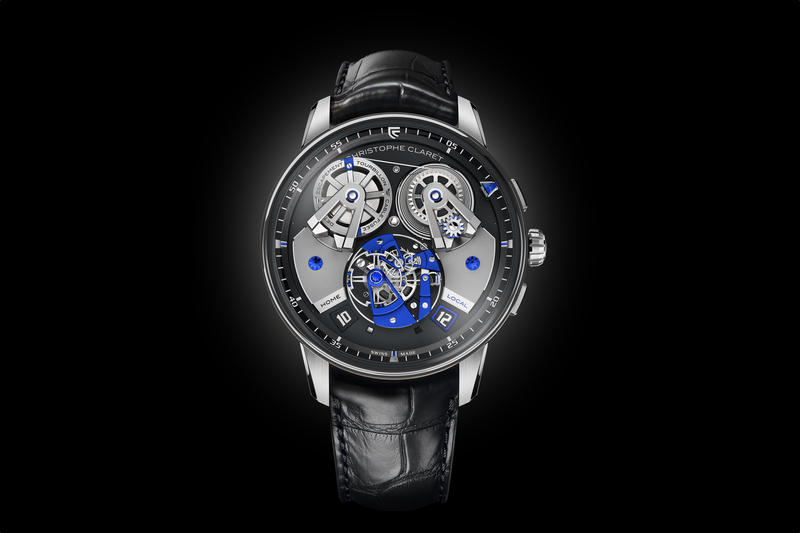 Functions include hours and minutes, 60-second flying tourbillon, and a 4-note minute repeater playing Westminster Quarters. 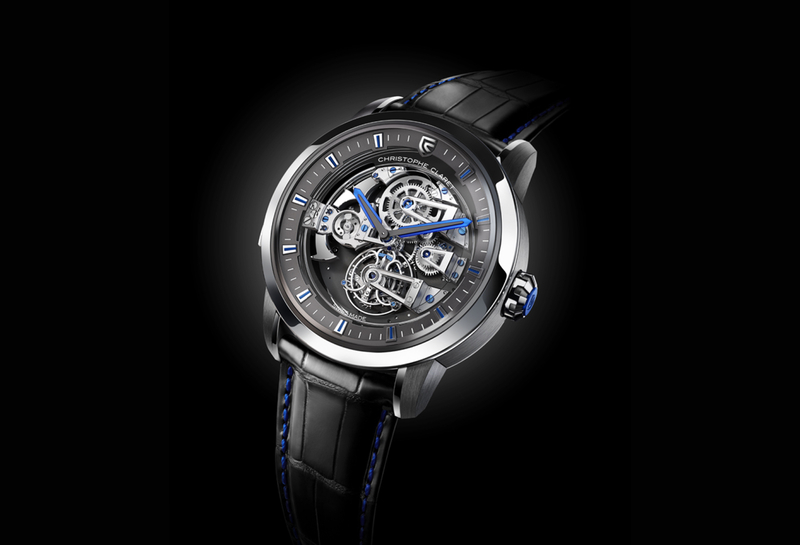 Some unique features include: Charles X style stepped bridges, Swiss lever escapement and tourbillon regulator with parachute shock absorber, four visible hammers — four patented cathedral gongs and repeater mechanism features silent inertia governor. Transparent mainspring barrel acts as movement state-of-wind indicator: when the movement is fully wound the spring is centered in the barrel. The repeater mechanism is activated by a slide on the left side of the caseband. The crown is in either red gold and titanium (red gold case) or white gold and titanium (white gold case). To minimize barriers to sound − and to maximize visual appreciation of the finely finished movement and the operation of the striking mechanism − the Soprano has no dial which allows the beautiful melody out and showcases the tourbillon, repeater operation, mainspring barrel, winding mechanism and Charles X bridges. The case of the Soprano is in three parts: upper and lower (bezel and caseback) sections in gold and a central titanium caseband. Titanium was selected for its superior sound transmission qualities. Where gold tends to deaden sound, titanium effectively transmits sound from the interior of the case to the exterior. The sound qualities of titanium are so good that the metal is often used for saddle bridges in high-quality guitars. Christophe Claret has an affinity for the tourbillon escapement, for both its kinetic beauty and its superior chronometric performance. In fact, Claret is so dedicated to the tourbillon that it is the standard escapement for all of his manufacture movements. The 60-second tourbillon carriage of the Soprano is on full view through the open dial at 6 o’clock and is supported by a single arm stepped bridge in the characteristic style of Charles X. Abraham-Louis Breguet invented the tourbillon escapement at the end of the 18th century, so it is only fitting that Claret has complemented the Soprano’s tourbillon with a ‘parachute’ shock protection system – another Breguet invention. .
Black hand-sewn alligator leather with black stitching (red gold case), red or blue stitching (white gold case). Buckle in Red gold and titanium (red gold case) or white gold and titanium (white gold case). Water-resistance 30 meters. Two limited editions, eight in red gold and eight in white gold. 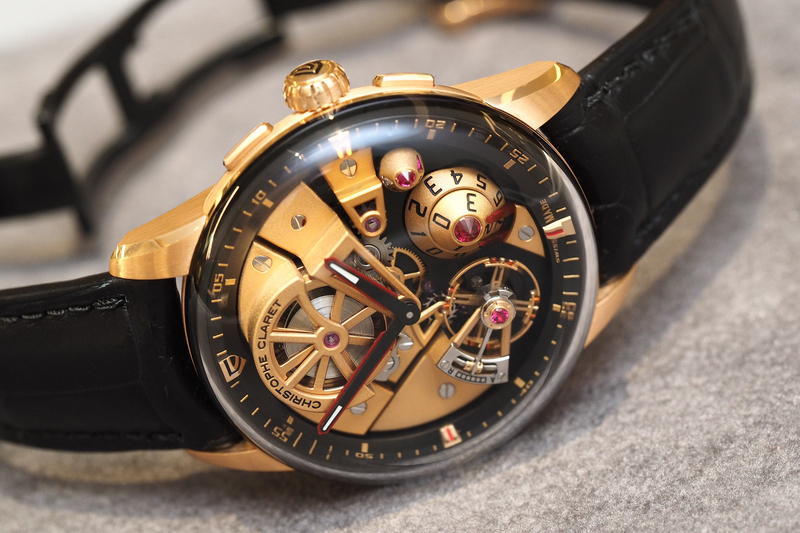 Christophe Claret is a true watch manufacture, and this timepiece pays homage to their watchmaking expertise – especially: minute repeaters, tourbillons, and sapphire components. The retail price is $500,000.